We walked with the crowd of people toward the old, dilapidated building. Angry weeds forced their way through every visible crack and crevice. We moved in silence as an overwhelming sense of sadness settled around us like a thick blanket. We stared at the building and watched as women filtered in and out of the door that creaked in protest each time it was forced open. We watched and we prayed. My husband, two children and I were standing outside of our city’s abortion facility. Not your typical Saturday family outing. I’ve gotten more than a few strange looks and comments from people when they learn that we’ve taken our children to the abortion facility. And I can’t say I blame them—I’m sure it seems weird on several levels. For one, convincing a 4-year-old and almost 2-year-old to be quiet and cooperative while praying for women walking toward their abortion appointments is no easy task. But what probably seems strangest is the fact that we’re exposing our children to such darkness. And if I’m honest, I used to wonder the same thing. I wondered if I was wasting my time and energy doing something my kids would never remember. And I wondered if I’d be giving them more than they could handle. This man wasn’t ranting against watching TV or enjoying lazy Saturday mornings. Rather, he was challenging us as parents to be honest with our children about the pain and evil in this world. Because if pain and evil do not exist, then the need for the gospel—for a Savior—doesn’t exist either. Does this mean we give our young children all the details about terrible realities in our world? Of course not. But we must tell the truth (in age-appropriate ways) about our world’s brokenness and our need to be rescued. The reality is this: our children will come face-to-face with these truths one way or another. I want my children to not only hear these things from me, but to also be equipped to respond to them with a biblical worldview. 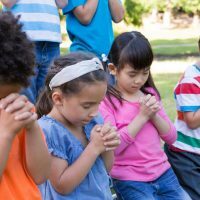 We take our children to the abortion facility to pray. We take them to our local pregnancy resource center so we can volunteer together in small ways. We pray as a family for the moms and dads who are scared and don’t know what to do. We give financially to support our pregnancy resource center. We talk regularly about how all lives have value, are made in God’s image, and deserve to be protected. We practice being gentle with babies and smaller children. We encourage our oldest to protect his younger sister, and affirm him when he demonstrates bravery by sticking up for her or showing gentleness toward her. Creating these simple habits forces us to put our faith in action. It shows our children that we don’t just say we’re pro-life, but we live it, too. The most dangerous places for our children are not the places where darkness is present. Rather, the most dangerous place is in a self-contained world where evil is ignored and people who are hurting are someone else’s problem. Ephesians 5:11 says, “Take no part in the unfruitful works of darkness, but instead expose them.” We must teach our children not to shrink back from darkness, but to confront and expose it with the light of Jesus. Shining light into darkness—and doing so with the confidence that can only come from Jesus–is what every Christian is called to do. And living in obedience to Christ? For us—and for our children—that is the safest place. By: Mary Holloman works for Greensboro Pregnancy Care Center in North Carolina and is passionate about advocating for women experiencing unplanned pregnancies. She is the host of The Empowered Advocate podcast, which exists to empower listeners to advocate for both women and unborn children. When not working, she loves spending time with her husband and two sweet children. You can follow more of her work at www.maryholloman.com.